I’m not sure whether it’s the change in altitude and air or whether my skin just wants to let loose, but my skin is always out of whack when I travel. For example, whenever I go to New York, my skin always gets super dry and scratchy, but when I head to somewhere more humid I always tend to break out and it’s as if my pores have just completely clogged up. Since I’m going to be traveling multiple places while abroad, I have to be ready for any weather scenario – both for my wardrobe and my beauty bag. 1. Simple Skincare Cleansing Facial Wipes – am I the only one who hates eye makeup remover? It’s way too oily and always gets in my eyes. I hate the film it leaves on my skin! I also really don’t love how cotton balls feel on my face and leave little tufts behind. When Simple Skincare launched a few years ago, I was pulled in by their claims of being perfect for sensitive skin and have been hooked ever since. These wipes are a true lifesaver. I take them everywhere with me! I even leave them in my car. It’s great if I’m in a rush and don’t have anywhere to wash my face, but it’s also just become a routine for me every night when to remove my makeup. They’re available at any drugstore in the US. Highly recommend!!! Hopefully they carry this brand somewhere abroad – I’m taking like four packs with me, but I’m sure I’ll run out pretty fast. 2. Tata Harper Rejuvenating Serum – this product is a new one to my toiletry bag. I’ve heard so many good things about Tata Harper’s line, but had yet to test it out, when I received one of NET-A-PORTER’s gift sets (here’s the summer set!) in the mail. I always like to try before I buy, especially since so many beauty and skincare products are outrageously expensive. This one has now become a part of my daily routine! After I’ve taken all my makeup off at night, I rub a nickel sized amount of Tata Harper’s Rejuvenating Serum on my face, neck and decolletage to combat fine lines and help firm up my skin. It’s also a great moisturizing agent! What’s great about Tata’s line is that she has travel sizes for nearly all of her products. They’re not heavy and easy to stow pretty much anywhere. 3. Arcona Triad Pads – I remember learning about toner when I first found out about makeup (at the Clinique counter, naturally). While I do feel using a toner is an important step in balancing and cleansing your skin, I’m not a fan of carrying multiple bottles of liquid around (are you seeing a running theme here with the makeup remover?). The fact that the toner is soaked in these light pads makes it a mindless task that’s easy to incorporate into your daily routine, and super simple to cart around with you. I also have used toners that are way too harsh on my skin (that’s way harsh, Tai), but the Arcona Triad Pads are perfect for sensitive skin. 4. Laura Mercier Hydrating Foundation Primer – one of my favorite things about blogging is getting to try out and learn more about brands and cool new products. This time last year I did not own a single product by Laura Mercier, but then I partnered with the brand on a project at the end of the summer and have been obsessed ever since! My favorite item from her line is this Hydrating Foundation Primer. I put this primer on after I moisturize, but before I apply any makeup – it creates a protective barrier so that makeup does not absorb into my skin and helps it last longer. I originally used the signature Foundation Primer, but because my skin dries up so quickly throughout the day, I recently switched to the Hydrating formula. It definitely does the trick! 5. Supergoop City Sunscreen Serum +30 SPF – awhile back you may remember me asking for sunscreen recommendations for sensitive skin. I finally found one that doesn’t irritate my face, thanks to a reader (you rock, Molly!). She told me to try out Supergoop’s line and I have been more than impressed. I have used three different formulas from Supergoop and none of them have bothered my skin at all – it’s a miracle! My favorite of the three I tried was this City Sunscreen Serum. It’s a light formula and not oily, so it doesn’t leave a film or shine on your face. It’s wonderful for everyday wear under your makeup! 6. La Prairie Cellular Revitalizing Gel – I don’t know about you, but I get the worst bags under my eyes when I’m sleep deprived – and I’m never more sleep deprived than when I travel. There’s such little time in each place I’m planning to visit while abroad and I want to see as much as I possibly can. This kind of travel ambition keeps me up late at night and has me up early every morning so I can see everything I want to. On those particularly rough mornings, I reach for this cooling and revitalizing gel from La Prairie. It’s two main purposes are to target morning puffiness and dark under eye circles – the coolness of the gel helps wake my eyes up instantly. If you have more time than I will to dedicate to this part of your face, I recommend picking up Patchology’s FlashPatch Eye Gels. They deliver deep hydration to your eyes and refreshes them when you need it most. I’m packing these gels in my carryon so I can put them on during my last hour of the overseas flight. Miracle worker! What are some of your favorite skincare brands and products? I’d love some other travel-sized recs! Those Arcona pads are a must have for me. Love how refreshed and clean my face feels after using them. Great product round-up. 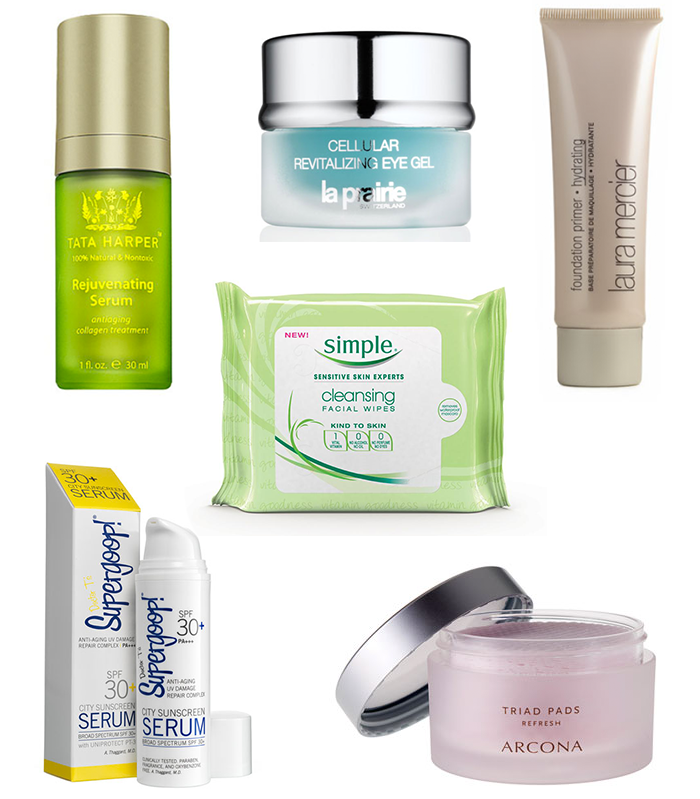 I’ve been wanting to try Simple’s micellar wipes, too, when I travel.